ON FRIDAY MARCH 8 the sport of boxing will be making its much anticipated return to the grand surroundings of the Royal Albert Hall and we are delighted to be the ones behind making this welcome development a reality. Fans of a certain age will recall with affection the days when the Albert Hall was pretty much the hub of British boxing and I am sure they will tell you there is no better place to watch all the action unfold. Now we intend to restore boxing to the South Kensington citadel on a regular basis so the new generations of fight fans can enjoy the experience themselves. I have called it a ‘posh York Hall’ but that description does it a bit of an injustice, but my point was that there isn’t a bad view in the house, whatever your vantage point and that is the beauty of watching boxing inside a stunning circular structure. It is just a fantastic venue to put back on the boxing landscape and there is always a great atmosphere there. To mark the occasion we are delivering on the dream held by our double Olympic gold medallist Nicola Adams, who will challenge for a world title in just her sixth fight as a professional. Nicola will need to be on top of her game against the 29-year-old Mexican, Arely Mucino, who holds a record of 27-3-2 and is a three-time world champion. Being moved along quickly was always Nicola’s objective in the pro ranks and now she has the opportunity to add to her history-making exploits, which I am sure the public will get behind. Sharing top billing is Daniel Dubois, our hugely talented young heavyweight, who takes on former world title challenger Razvan Cojanu. The Romanian has twice gone the distance in his last three fights – against Joseph Parker and Nathan Gorman – so it will be fascinating to see if Daniel can bring about a show-stopping finish. The progress of Daniel and Nathan demonstrates the health of the heavyweight division in this country. Obviously the public attention is captured by Tyson Fury v Deontay Wilder, whoever Anthony Joshua might end up fighting next and whether Dillian Whyte will get just rewards for his recent workload. But our two bright young heavies are rapidly making up ground on the big guns and you are not talking years and years before they will be right in the thick of it. What a time for British boxing that will be. 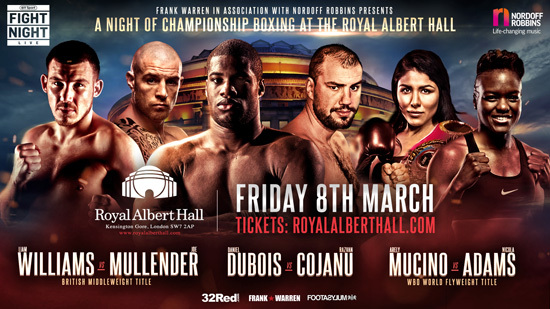 There have been some ferocious scraps at the Albert Hall over the years and another one could well be on the cards when Liam Williams defends his British middleweight title against Joe Mullender. Liam hardly put a punch out of place in winning a British title at a second weight against Mark Heffron in December and made a tough fight look easy. He proved that he is right back on his game working with new trainer Dominic Ingle and he has plenty of options moving forward at both weights. Joe, game as they come, won’t bring too many tactics to the table on the night and will just come to fight. Liam has operated at a higher level, but Joe will firmly believe he has the beating of him and it is a fight that will provide plenty of thrills and spills for the fans. Another one well deserving of a showcase fight at the Albert Hall is Archie Sharp who , last time out, ventured into enemy territory up in Leicester and parted Lyon Woodstock from his WBO European super featherweight title. The unbeaten Archie boxed a really smart fight, keeping on the move and pinging out the jab, while also being prepared to mix it when the time was right. He now gets to defend his title against the also unbeaten Lucas Ballingall in what is another great fight for him. There are so many possibilities in his weight division, what with Sam Bowen leading the way, Zelfa Barrett coming back from injury and Lyon looking to put himself back in the frame. These are the sort of fights we are looking to make because the fans want to see them. There is more to come for our return to a venue steeped in boxing history and it has all the makings of a memorable night. I WAS KEPT busy last week with a few key meetings that reached the public domain and the outcome of these was all positive all we continue to build for a big 2019. I had a good chat with Carl Frampton and the good news is that he indicated his desire to carry on boxing and hopefully we will be in a position sometime this week to firm up what the future holds for him. 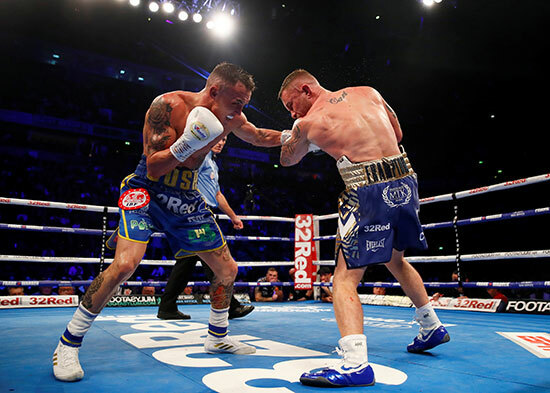 To my mind, Carl has got plenty left in the tank and shouldn’t have judged himself harshly after coming up against an inspired Josh Warrington in December. He rightly wants the big fights now and is deserving of them. We will get to work on making them happen for him, starting around June time. I also met up with Josh to plan his next moves and obviously his IBF mandatory fight against Kid Galahad is currently out to purse bids. We do, however, have another offer on the table that we will make a decision on this week. On the subject of IBF business, I do find it staggering that they have moved the goalposts, all of a sudden, regarding purse splits to 65-35 and I struggle to fathom the justification. It is something we will be challenging because when we applied for the exception of Josh to fight Carl and agreed to the subsequent mandatory, the rule at the time was 75-25 and we based our decisions on that split. Tyson Fury was my other date for the week and the good news for the fans is that things will start to happen fairly quickly now. Deontay Wilder has made it clear who he wants next, as has Tyson, so that is what we are all working hard towards.